Keeping West Michigan families safe since 1980. Quality craftsmanship & personal attention to your needs. Trust the professionals at Hancock Chimney Service. 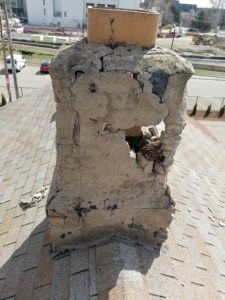 Leaking chimney? Let our experienced technicians diagnose the issue and offer a solution! Do you have an ugly chimney? Let Hancock Chimney Service make your chimney beautiful again! Trust the professionals at Hancock Chimney Service to provide you with exceptional chimney service performed by certified technicians. We are an authorized “Heat Shield” chimney liner repair dealer, install Pacific Energy Stoves, perform chimney fire repair with your insurance company, repair fireboxes and smoke chambers, and diagnose leaking and drafting problems. We proudly stand behind all of our products and services. All of our products and services are warrantied. We strive to deliver exceptional, 5-Star Service! Our customer’s satisfaction is our top priority. The technicians were very professional and answered all of my questions thoroughly! I will be recommending your services to my friends and family! I am thrilled I called Hancock! Jason was extremely helpful and very knowledgeable. I look forward to a continuing relationship with your company. Service was great and professional. Crew was very informative about the stove and chimney as well as recommendations for repairs. They were very helpful in helping understand about how the fireplaces work and function. Very friendly and gave me a good understanding of what the issues were. Appreciate everything that was done. Thanks for sending out Jason and Chris. I feel like Im in the hands of real professionals. Fabulous service and staff. Jason and Chris were wonderful! Enjoyed having them here to answer my questions and give me a good estimate of the health of my fireplace. Terrific work, so glad we called you. Will highly recommend to our friends and neighbors. Very pleased. Technicians were on time and careful of my furniture. They seem to be very knowledgeable and were very thorough in explaining need for repairs. I have used Hancock for more than thirty years and will continue to do so. These guys were absolutely great. Very quick and efficient as well as courteous and kind. Extremely respectful of our house too! Very professional and neat. I wasn’t here at the time of the of the appointment but they waited for me to arrive. On time, professional, friendly, VERY informative. Awesome! Excellent and experienced gentleman. Will call again for other services. Excellent job. Fast, friendly, and explained everything. See you again next season. Showed up on time. Jason is very knowledgeable. Did everything that was needed. Thank you! Great company, very professional, fast and reliable! Here on time and very clean! Great experience. Forrest and Austin were wonderful! They were very professional and explained what they were doing. They informed me of a problem with creosote and clearly explained our options to rectify the problem. They also left our house clean. I would highly recommend them! Great service and honest answers without any up selling. We will continue to use this company. The inspectors were very professional and extremely knowledgeable. I was well pleased dealing with them. The guys were extremely knowledgeable and explained things well. I would recommend them and the company. Great experience. They kept everything clean and were courteous and respectful. Very happy with their work! Did a good job explaining their recommendations. The service was excellent. Great service, very timely, called in advance to confirm. Arrived on time and very thorough. They have great equipment to ensure your chimney is in great working condition! Excellent experience. Right on time and very efficient. Thank you for the great/thorough job! Both Jason and Chris are very professional, polite and efficient at what they do. Very helpful and informative! We will use Hancock again! Very informative and helpful to a novice chimney owner. Employees were approachable and polite. Fantastic, professional service. Technicians were great and knowledgeable. At first I was concerned by the cost, but I realized right away that Hancock was the most professional chimney company I have ever dealt with. They put safety first, and their quality of work is much better than the others. It was a pleasure to work with Hancock’s polite and professional team! I can now use our chimney with full confidence–winter is almost here! Hancock Chimney Service saved us from a potential home fire by detecting dangerous problems in our chimney. They used video technology to detect, record and show me the problems my chimney had. I could see it live while their camera was in MY chimney. Everyone should have their chimney inspected to avoid potential fires. They also informed me that my homeowners insurance would normally cover any repairs if I needed them. Thank you Hancock Chimney! We are a property management company and have used Hancock Chimney for several years on several of our homes. Everyone is extremely competent and professional and would recommend Hancock Chimney to future owners and friends. We were so impressed with the team from Hancock! They did great work and treated our home like it was theirs. We’re happy to pass your name on to our friends! Jason is really terrific to work with, reliable, and very knowledgeable! I call on you guys for our own home + investment properties. In particular, the inspections on the prospective investment properties have been worth every penny to properly evaluate cost of improvements. Highly recommend calling Hancock Chimney! Top notch from start to finish!!! I will be in contact come spring for your services once again. Everything about the service we were provided, removal of a cement liner and installation of a new, metallic one, was professional, timely, and courteous. We are happily loyal customers. It was a very good experience. The technicians were very helpful and explained all the steps of the process. Everyone very professional! My wood burner stove is working like new because of the new stainless steel flu installation! I was very satisfied. Everyone was professional, courteous, knowledgeable and efficient. We purchased our 36 year old home in 2016 in Holland, MI. Hancock Chimney was recommended to to give us an assessment of the condition of our chimney flues. We have two gas fireplaces in our home. They were able to show us with their cameras the cracks in our chimney flues that needed attention and re-sealing. Technicians Nate and Reese came to our home and did expert work doing the repairs that come with a twenty year warranty. They were personable, professional and competent. We are happy with the service rendered. Very grateful Hancock Chimney Service is here. .. very knowledgeable, personable and professional. This applies to office staff as well as technicians. I received a reminder call about our appointment and the techs. were right on time. They also took precautions to minimize any mess (they left no mess at all). Thank you all VERY MUCH!! CONTACT US ABOUT OUR WARRANTIES.